Meet Dana Simson! A world of joyful imagery, uplifting color and useful art. Dana working on a tile table top commission. Inside the store at Chesapeake East. Dana working on a large mural installation featuring animals from the Chesapeake Bay. I dwell in a place of deep love for our natural world and the beauty it so generously offers us. At home, surrounded by a big sky and the Chesapeake Bay, each day comes with visual gifts that fill my heart. I am quite content spending the day with my animal friends, chatting at length with any creature that will listen. This is the fuel that runs my imagination. There is never enough time to pull all the ideas that form out into a painting or ceramic. Each day is a new opportunity to enjoy the journey onward. Dana Simson’s engaging imagery has been licensed in fabric, rugs, stationary, home decor, gift items, and tabletop. She has 15 published books including 4 children’s picture books, gift books, a pop-up book and her latest Trumpzine. Dana’s work is in many private collections and several museums. Her artwork has been featured in many national magazines, placed in TV shows and Hollywood movies, including Titanic. Dana’s latest work includes several books, along with new designs in ceramic and paintings. You can visit her store- FULL of original paintings, handmade/painted ceramic, jewelry, gifts, books and stationary at 501 West Main Street, Salisbury, Maryland. Her store/studio is in a wonderful vintage brick building right on the Wicomico River. Upstairs you can stay in any of 4 beautiful artful lofts- offered through Airbnb. A note from Dana: My artwork is inspired by the deep joy I find in nature, especially at our home on Maryland’s Eastern Shore. We tangle with the hardwork of restoring a century old farmhouse, living organically and ocasionally driving home through the high tides that periodically reclaim what passes for our road. We named our home Secrethouse, because when we discovered it no one had lived here since 1950 except foxes and black snakes. (Both still visit) I hope to share the stories and inspiration of the Secrethouse property with you through my paintings and my blog. 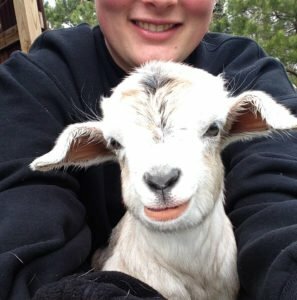 Fat Lester is king of the goats. and well mannered unless something looks tasty. Giles as a kid, the latest bottle-fed baby. She is goat ambassador to those willing to give her a pat. 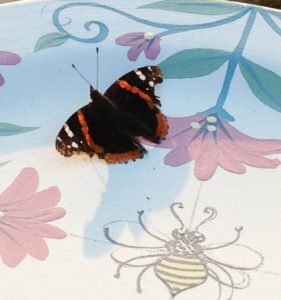 Sometimes Dana works outside- here a butterfly wonders about the flower being painted on a set of dinnerware. I believe I have your ceramic fish. The bottom is signed Simson MD. Could these be by you? yes- they sound like it.